Michelin Green Guide Wine Trails of Italy. Michelin Guides, 2013. Cynthia Clayton Ochterbeck, editorial director; Maura Marca and Carlo Vischi (in collaboration with Debora Biona), contributing writers. I love visiting Italy, meeting the people and trying to speak the beautiful language. I’ve spent more time in Italy than any other country outside the U.S. (thanks in part to a stint teaching at the Johns Hopkins Center in Bologna), so I’ve learned a lot about the food and wine and always look forward to going back to learn more. I have accumulated far more than my fair share of Italian touring guides, which I enjoy reading before, after and during each trip. 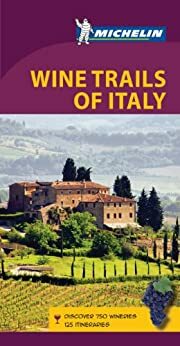 The publication of Michelin’s new Wine Trails of Italy was the perfect excuse to dig out some of my favorite guides and compare them to this new one. Standard operating procedure for a trip to Italy at The Wine Economist office involves collecting together a number of timeless references — the usual suspects. I always start with Burton Anderson’s classic The Wine Atlas of Italy & Traveler’s Guide to the Vineyards, which somehow manages to be informative and relevant more than 20 years after its publication (it was the Veuve Clicquot Wine Book of the Year for 1990). Anderson’s wine atlas paired with the most recent edition of Gambero Rosso’s Italian Wines guide is usually enough to get me started. Anderson gives the broader context and Gambero Rosso shows me what’s new. Connecting the dots is up to me. The Italian Wine Guide from the Touring Club of Italy is another indispensable (if now somewhat dated) companion. But it is impossible to visit Italy and to taste Italian wines because, well, what is Italy anyway? Mario Batalli once said that there is no such thing as Italian food, there are only the many regional cuisines of Italy and I think that this remark holds for Italian wine, too. So inevitably I search for regional wine touring guides to match my focused travel itinerary. Hugh Johnson edited a series for Mitchell Beazley called Touring in Wine Country that included handy volumes on Northeast Italy and Northwest Italy (as well as Burgundy, the Mosel and other regions). I love these guides, which focus on wine towns and wine trails, with excellent advice on hotels, restaurants, wine and food shops, and of course wineries. Meaty, but just compact enough to fit into a day pack or car glove box. I still pull out these Mitchell Beazley guides when I’m putting together a trip, but they haven’t been updated in nearly 15 years and the specific information they provide is now stale, even if much of the general advice remains relevant. So where does the new Michelin guide fit in? Well, the format is attractive as you might imagine from a publisher with so much travel guide expertise. The volume is narrow, deep (more than 500 pages) and packed full of information. The first 50 pages are filled with Wine 101 information (how to taste, what temperature is best, how to extract the cork, etc.) that does no harm even if it will do little good for seasoned readers. A general introduction to Italian wine serves as a preface to wine regional wine itineraries, which vary in length from just a few pages (for the Aosta Valley and Liguria regions for example) to about 50 pages for Tuscany. Obviously it is impossible to provide a truly comprehensive guide to any Italian wine region in such tight quarters, so this is an exercise in leaving things out. If you are OK with the deletions, then you’ll be happy with the guide. Detailed maps were the first thing left out in the Michelin guide and this annoyed me at first, but then I realized that it would just be impossible to include all the necessary maps in such a brief volume. You’ll need to buy driving maps (Michelin maps, presumably) if you want to follow the routes. But, a few more maps would be useful if only to help see how the various wine routes are related. Better maps would be my #1 request if these books are ever revised. Each chapter begins with a quick overview of the region, its wines and the grapes the wines are made from. This is followed by suggestion wine route itineraries presented in a format that will be instantly familiar to anyone who has ever used a Michelin guide. These travel narratives are followed by a data section that lists tourist contact numbers, identifies the regional wine cellars and presents brief but well written profiles of selected wineries. A very short list of accommodations brings the chapter to an end. Compared to the other wine tourist guides on my bookshelf, the Michelin guide provides more non-wine information — a fact that puzzled me at first. But I guess you can’t live by wine alone, even in Italy, and knowing more about the cultural tourism elements is surely worthwhile, Indeed, I stumbled across some information that I wish I had known on my last trip to Alto Adige! I suppose that it just makes sense for a Michelin wine tourist guide to draw heavily on the core knowledge base of the main Michelin guides. Bottom line: Not a perfect wine tourist guide to Italy, but a very good compromise and a useful addition to the day pack. More depth and detail would be great, but obviously impossible given the scope of the guide. A wine guide that ignores food seems just wrong (especially in Italy), but I suppose there are apps (or other guide books) for that. It’s a good volume to use in concert with other travel resources. I still nurture a small ray of hope that Mitchell Beazley will revise those old wine touring guides or that the Touring Club of Italy will come out with a new edition of their guida, but until they do this Michelin guide will help fill the void.